Masaley Dar Khitchri recipe by Mrs Durrani at PakiRecipes.com. Khitchri is a full meal i itself. 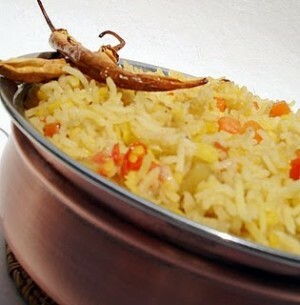 Masaley dar Kitchri is a spicy and quick and easy food prepared with a combination of rice with lentils. Put beef in a cooking utensil and put 45 cups of water and let it boil and put 2 whole garlic clove and 1/2 ginger in it and let it cook till the beef has become tender. Now remove the beef and drain the water in a bowl and shred the beef. Now put oil and add chopped onions and let it fry till it has become light golden brown now add chopped tomatoes, green chillies, salt , red chilli powder, haldi and sabut garam masala and let it cook till the masala leaves oil now add the beef and cook it for sometime and now add 1/2 cup water and let it simmer till the water has dried add rice with 41/2 cup water (yakni) previously drained out in a bowl and let it cook while stirring occasionally so that it doesnt stick at the bottom. Let it cook till the rice has become very soft and look mushy.